Hmmm, I think I like this one even more than Happy Birthday, maybe. I’m not sure… I like the idea that I can do glitter but still keep it looking a little sophistimacated you know? My idea behind this one (ooh get me, *idea*) was to emulate (ooh get me, *emulate*) the rubbish Summer we’ve been having. OK, it totally wasn’t…. it’s just reminded me of rain after the fact and I thought I’d try and sound a bit arty but I can’t even convince myself for half a second let alone anyone else. But it does look like silver raindrops against a cloudy sky right? Just nod. It’s easier for everyone in the long run. That’s one coat of Today Was A Fairytale* over American Apparel Factory Grey (also one coat). Which makes the entire manicure a two coat wonder. Looks like more right? I’m suitably pleased!! I’ve decided that I prefer a top coat over the Deborah Lippmann glitter polishes. You don’t *need* one but if you do… just one coat renders the surface perfectly smooth like a normal manicure. I lovee the look of this nail polish! I got into glitters as topcoats thingy recently, and did a Senorita Bonita under Golden Goddes and loved the result. The only thing that puts me off DL polishes is a) the price and b) the snobby House of Fraser SA that told me off for trying to swatch Glitter Is In The Air tester. I like this very much but £16 is a lot of money. If anyone knows a dupe, please tweet me @aussiegirlblogs I have one Deborah Lippmann “Las Vegas” and I didn’t like it when I tried using it twice before but last week I dug it out and used it and I liked it. I think the formulation is weird but I think most of her formulations are different (so I’ve been told) and I don’t know which ones of her’s are Jellies. It works so well over the grey, extremely pretty! So pretty! A 2 coater too? Perfect. I definitely get where you are going on the rain theory! mmm i have had my eye on these polishes for a while and this one is sooo eye catching…but i have to agree, is it really worth splahing out £16 for!! Whoa, so beautiful! 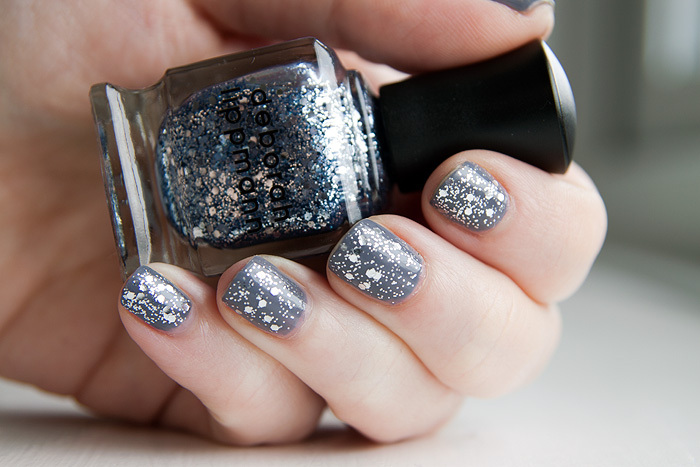 These Deborah Lippmanns just get lovelier and lovelier. Sigh. Going to hae to try out this duo when Autumn knocks around. I fully understand the rain vibe you get – hence why waiting til the rain(ier) season to try it out!